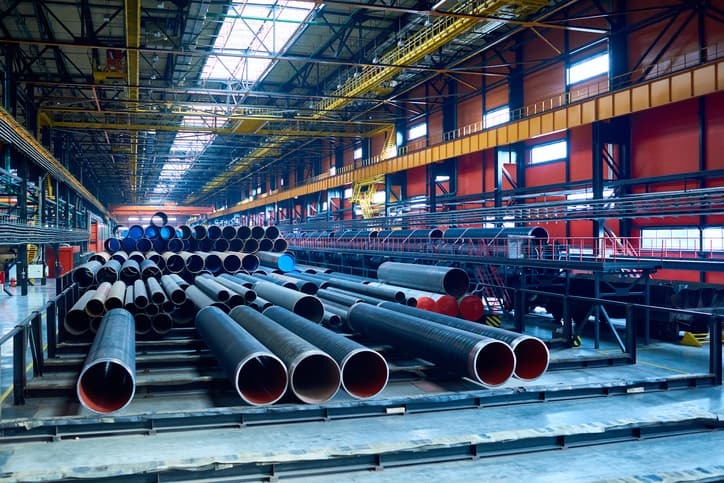 Carbon steel piping transports fluids in an assortment of industries, but, for high-pressure and temperature applications, the welded joints on its cross-section are not ideal. Therefore, for high-temperature and pressure applications, such as in process piping, boiling plans, compression stations, and refineries, seamless carbon steel pipe finds prominence. Seamless pipe incorporates no welding or joints. Instead, it is made from a solid round steel billet, which is heated and extruded until the steel is shaped into a hollow tube. ASTM A106/A106M-18: Standard Specification for Seamless Carbon Steel Pipe for High-Temperature Service standardizes this type of pipe. Specifically, it addresses seamless carbon steel pipe for high-temperature service in (nominal pipe sizes) NPS 1/8 to NPS 48 (otherwise known as DN 6 to DN 1200) inclusive, with nominal (average) wall thickness as given in the standard ASME B36.10M-2015: Welded and Seamless Wrought Steel Pipe. Please note that this other document, ASME B36.10M-2015, standardizes the dimensions of welded and seamless wrought steel pipe for low or high temperatures and pressures. ASTM A106/A106M-18 expands upon the guidelines found in the ASME standard to aid a user in furnishing seamless carbon steel pipe, so it may persist and function in anticipated high-temperature service. This type of pipe may be suitable for bending, flanging, and similar forming operations. It may also be suitable for welding. However, when the steel is welded, it is presupposed that a welding procedure suitable to the grade of steel and intended use will be utilized. ASTM A106/A106M-18 details the process of preparing the steel and guidance for heat treatment (if necessary), chemical composition, heat analysis, product analysis, tensile requirements, bending requirements, flattening, hydrostatic, and nondestructive electric tests, lengths, sampling, and appearance. Furthermore, for the producer and purchaser, the standard specification includes information for certification, product marking, and ordering information on seamless carbon steel pipe produced in accordance with its guidelines. ASTM A106/A106M-18 also covers supplementary guidelines that are optional for compliance with the document. These are provided for seamless pipe intended for use in applications where a superior grade of pipe is necessary. ASTM A106/A106M-18: Standard Specification for Seamless Carbon Steel Pipe for High-Temperature Service is available on the ANSI Webstore.